Syrian Forces Tightening Grip On Parts Of Homs The Syrian army has reportedly cut off all escape routes from the rebel-held neighborhood of Baba Amr in Homs. Syrian tanks were seen moving closer to Baba Amr on Thursday, as efforts continued to negotiate a cease-fire to evacuate the wounded, including two Western journalists. Flames rise from a house, the result of Syrian government shelling, in the Baba Amr neighborhood of Homs, Syria, on Wednesday, in this image provided by citizen journalists to the Local Coordination Committees. The Syrian army has cut off all escape routes from a rebel-held neighborhood in Homs, the city that has seen the most intense fighting in recent days, according to opposition activists. Syrian tanks were seen moving closer to the Baba Amr neighborhood Thursday, as efforts continued to negotiate a cease-fire to evacuate the wounded, including two Western journalists. She explained that her fractured leg needed medical attention beyond the means of the battered and depleted field hospital in Baba Amr and asked for urgent help to arrange safe passage for wounded civilians to get out of the area. Near the end of the video, the cameraman begins to explain in English the danger of the situation: "We plead for you to come and evacuate them and give them the right medical attention they need." But the loud explosion in the background said all that needed saying. In a nearby neighborhood, an activist who gave the name Abu Khaled told NPR that Thursday's tank movements not only cut off any escape from Baba Amr, but brought the tanks to the Jobar neighborhood where women and children had been sent for safety. He said, wearily, that the relentless assault could be nearing its endgame. "If the army enters, it will be the end. In the past, the rebels would fight until they ran out of ammunition, then they would withdraw. But this time there's no way to withdraw, plus they don't want to leave the journalists and the wounded," he said. "Guys I talked with are saying, 'That's it, I'm fighting to the end.' "
Homs activist Omar Shaker — not his real name — told NPR that regardless of whether the army launches a ground assault, those left in Baba Amr are in great jeopardy. "If they don't die from shelling, they'll die of thirst or hunger. It's very cold — a few days ago it was snowing. There aren't enough blankets, the kerosene for heaters is running out. 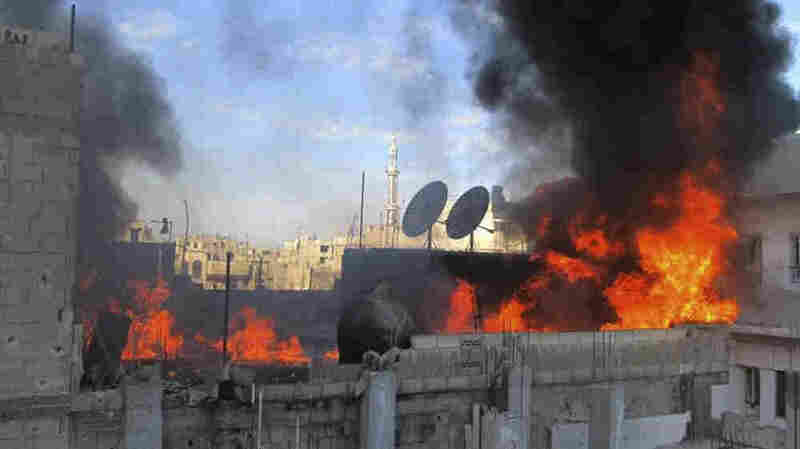 Parts of Baba Amr are just piles of rubble," he said. The Syrian Foreign Ministry offered condolences to the families of American journalist Marie Colvin and French photojournalist Remi Ochlik, who were killed in Baba Amr on Wednesday. It also called on journalists to avoid entering the country illegally in order to reach what it called "turbulent and unsafe places." Despite earlier reports saying that wounded British photographer Paul Conroy was on his way out of Syria, he appeared in a video from Baba Amr in which he asked for help but mainly seemed interested in telling people not to worry. In the video, he is heard saying, "No, just any help possible, and just reassure family, friends in England that I'm absolutely OK."
The Conroy family will be just as worried as thousands of Syrian families, though, as long as the military assault goes on.